We have money to bomb Syria, but not to help Syrian refugees. The U.S. launched a campaign this week on Kickstarter -- a crowdfunding website on which people around the world can donate to fund proposed projects -- to help provide aid to Syrian refugees. All proceeds will go to the U.N. High Commissioner for Refugees (UNHCR), the leading international body on refugees. In its statement announcing the initiative, the White House draws parallels to the 1885 funding of the pedestal of the Statue of Liberty (the statue itself was provided by France), which it depicts as the result of a kind of pre-internet crowdsourcing campaign. What the White House does not mention in its rosy retelling of the history of the majestic monument, however, was that crowdfunding was relied upon for the pedestal because politicians refused to fund it. Grover Cleveland, governor of New York at the time, vetoed a bill that would have allotted $50,000 (approximately $1.3 million today) for the Statue of Liberty. Congress rejected a proposal for $100,000 ($2.6 million, adjusted for inflation) in funding. The only reason the money needed to construct the pedestal was raised was because publisher Joseph Pulitzer used the fundraising project as a kind of marketing campaign to boost the circulation of his yellow-journalism newspaper the New York World. A political cartoon published in the magazine Harper's Weekly in May 1885 succinctly and sardonically summarized the entire process. It depicted a poor man in shoddy garb begging an exquisitely clad rich man for "a few pennies" to fund the Statue of Liberty. "Oh, get out; you're off your base," the disgruntled bourgeois rejoined. The White House's choice of analogy, then, is, perhaps unwittingly, the perfect one. It illustrates the skewed priorities behind such a campaign. More than four million Syrian refugees are registered with the U.N. A disastrous civil war has ravaged Syria for over four years. Refugees are fleeing extreme violence -- bombs dropped incessantly on civilian areas by the Assad regime, heinous mass killings and ethnic cleansing by ISIS, war crimes committed by al-Qaeda affiliate al-Nusra (which is supported by U.S. allies such as Saudi Arabia and Turkey). Germany, which originally pledged to take 800,000 refugees, is preparing to take 1.5 million this year alone. The U.S., on the other hand, which originally pledged to take just 10,000, announced it would take 100,000 asylum-seekers each year from around the world, not just from Syria. Germany's population is one-fourth that of the U.S.; when adjusted for size, then, it will be taking 32 to 60 times more refugees. There is no dearth of funding for refugees, or for other humanitarian and social causes -- far from it. The problem is not that there is no money; the problem is that that money is being frittered away on other things, namely war. The average American thinks 28 percent of tax dollars goes to foreign aid; in reality, the U.S. spends less than one percent of its federal budget on foreign aid -- and much of this goes to health and economic projects and is used for political leverage, not humanitarian assistance. More than one-third (37 percent) of the entire world's military expenditure is spent by the U.S., which has just one-twentieth of the global population. 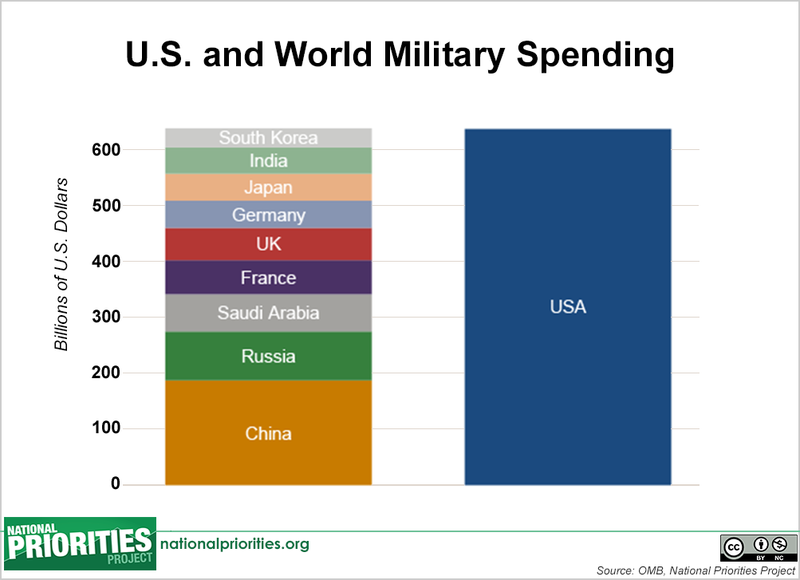 Washington spends more on the military than the world's next nine-largest militaries, or most of the other countries in the world, combined. 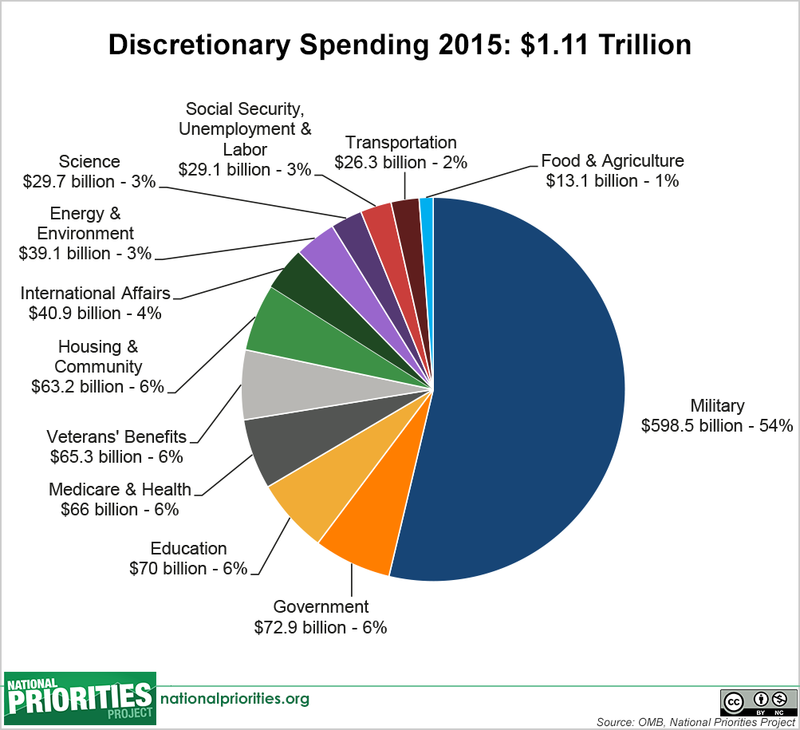 A prime example of this outlandish spending -- and the deranged priorities it evinces -- can be seen in the U.S. bombing campaign against ISIS. In August, after a year of airstrikes on ISIS in Syria and Iraq, the Pentagon announced the U.S. had spent over $3.5 billion, at an average cost of $9.4 million per day. The Kickstarter campaign launched by the White House to help Syrian refugees, on the other hand -- which is based on donations not just from the U.S., but rather from around the world -- raised just around $1 million in two days. Moreover, American intelligence agencies have admitted that, despite the billions of tax dollars spent and hundreds of civilians killed (whose deaths are not reported in the American media), U.S. airstrikes have not weakened ISIS at all. The extremist group uses the fact that the U.S. is bombing it in order to recruit new fighters just as quickly as U.S. airstrikes kill them. In other words, almost $10 million tax dollars are getting flushed down the drain every day for what experts readily admit is a useless war, while the government resorts to internet crowdsourcing to raise pennies for refugees fleeing the merciless repression of the Assad regime and ISIS in the country it is ineffectively bombing. In other, other words, the U.S. military spends almost 20 times more money every day on fruitless airstrikes than the entire world raises in one day of crowdfunding for desperate asylum-seekers. Remember that aforementioned political cartoon, about the funding of the Statue of Liberty? This is how social services work in the age of global neoliberalism: Governments spend trillions on weapons and war every year, but create crowdfunding campaigns that rely on individual donations. Citizens do not have the choice of not paying for weapons and war -- the tax dollars that go to these come straight out of their paychecks -- but do have the choice of helping the victims of weapons and war. The former is mandatory; the latter is elective. Jeremy Corbyn, the new leftist leader of the U.K.'s Labour Party, has proposed the idea of making funding the military optional. Taxpayers "have a right of conscience not to participate in the armed forces in time of conscription and should have a similar right in time of peace to ensure that part of their tax goes to peace, not war," Corbyn said. Yet this policy is very far from popular, and is smeared as "unrealistic" and even "absurd" by a political and economic establishment that has ingratiated itself with never-ending (but profitable) war. The U.N. and its agencies like the UNHCR are funded through donations. The bulk of this funding has traditionally come from governments. In the Kickstarter campaign it is spearheading, on the other hand, the White House says it and the UNHCR have "joined forces" with a slew of powerful corporations, including Starbucks, Airbnb and Twitter, to raise pennies for refugees. Everything about the initiative seems ludicrous, with a tinge of the dystopian, even. It sounds like a right-wing dream -- the government working with large companies to raise money via voluntary donation, while blowing trillions on war. Governments are shirking their duty to assist those adversely impacted by war. U.N. humanitarian agencies are drastically underfunded, while struggling to grapple with the worst refugee crisis since WWII. Yet, instead of funding the UNHCR, hegemonic governments are creating more work for it by fueling the violent conflicts that create more refugees. Taxation serves a purpose, a social purpose. When the social purpose of taxation is replaced with an appetite for endless funding for war, and when social services like humanitarian assistance are left to charity, governments' priorities are clearly skewed and compromised. Crowdsourcing sounds like a great idea. At the surface, it appears to be democratic. But by relying on crowdfunding, the U.S. is falling back on a libertarian dream -- charity. Charity puts the burden on average working citizens, many of whom do not have much money to spare at a time when the economy is in the doldrums, when quality job prospects are low, when poverty is ever on the rise. Charity makes it optional for the rich that have benefited from and exploited the system to pay their fair share. Instead of voluntary charity, the U.S. and other governments around the world should be pledging greater funding for the UNHCR. They have the money. Leaving refugee assistance to crowdsourcing while pouring trillions of tax dollars into war is a sign of moral depravity -- particularly when war is responsible for creating refugees in the first place. This egregious imbalance of priorities should greatly concern each and every citizen. They are, after all, paying for it.